Anyone else use boomerang with their Gmail accounts? Well this has been bouncing back to me almost every week since November. I have meant to make a post about it because everyone doesn’t know about it. You can get it here. Freddie Mac announced April 29 that beginning June 30, the Uniform Collateral Data Portal (UCDP) will deliver new proprietary feedback messages for appraisals submitted to Freddie Mac and also will return a proprietary hard-stop code that will not allow for users to override. Freddie announced that the new proprietary messages are aligned with the government-sponsored enterprise’s effort to provide improved appraisal quality feedback. Currently, if lenders receive hard-stop code “FRE800,” Freddie Mac proprietary messages automatically are overridden, and the code does not prevent lenders from receiving a “successful” status when the appraisal is submitted in the UCDP. Beginning June 30, when the following three Freddie Mac proprietary fatal edits are activated on all UAD forms, lenders will receive a new hard-stop code, “FRE700,” which will prevent them from receiving a “successful” submission status. These fatal edits must be addressed, and an updated appraisal must be submitted to the UCDP before a “successful” status can be received. FRE1086 Signature Date Check: Triggers if the signature date of the appraisal is before the effective date of the appraisal. FRE1087 Appraiser Name Check: Triggers if the appraiser’s name is missing from the appraisal. FRE1040 Subject Legal Description: Triggers when the legal description is missing. Freddie also announced that four new feedback messages will be returned on all UAD forms submitted to UCDP to complement the “Single-Family Seller/Servicer Guide” requirements related to appraisal eligibility. The presence of these feedback messages may indicate that the appraisal and associated mortgage are not eligible for delivery to Freddie Mac. These feedback messages will be implemented as warning messages and will not prevent lenders from receiving a “successful” status. FRE1095 Subject Highest and Best Use: Triggers if the present use of the subject property does not represent the highest and best use of the property. FRE1094 Sales Contract Review: Triggers if the contract of sale was not analyzed by the appraiser on a purchase transaction. FRE1092 Condominium Hotel Project: Triggers if the condo project name appears to be a condominium hotel. 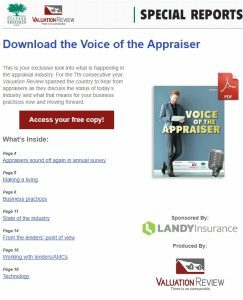 Finally, new appraisal quality feedback messages primarily will focus on overall completeness of UAD appraisal forms and will be initially activated only for the Uniform Residential Appraisal Report(Freddie Mac Form 70). Freddie Mac will provide sufficient notice as these messages are activated for additional and applicable UAD forms. Although Freddie said it anticipates these messages will be returned infrequently, appraisals with missing data occasionally get through. These feedback messages serve to assist and build on the quality control checks lenders currently have in place. The messages also will be implemented as warning messages and will not prevent lenders from receiving a “successful” status. An appraiser from Collier was sentenced today to 42 months in federal prison in mortgage fraud schemes involving two properties and three banks. After a two-day sentencing hearing, U.S. District Judge Terrence McVerry imposed that term on James Lignelli, 59, and ordered him to pay $300,000 in restitution to the lenders he ripped off by preparing false appraisals. Lignelli was found guilty of bank fraud at trial last summer, although the jury acquitted him on counts of bank and wire fraud conspiracy. Federal prosecutors said he provided inflated appraisals for loan applications in two schemes. The first involved Michael Pope, operator of Pope Financial Services, and Tiffany Sprouts, who ran Sprouts Mortgage. Assistant U.S. Attorney Brendan Conway said at trial that Lignelli prepared fake appraisals with the co-conspirators for a property in Peters, which was sold for $1.2 million. In a second scheme, Mr. Conway said Lignelli worked with Michael Staaf, operator of Beaver Financial Services, and prepared a fake appraisal for a property on Perry Highway in the North Hills. Lignelli and his lawyer argued that he was a dupe for the others, who he said had supplied him with false information about the properties. In trying to avoid jail, he also said he had already been punished because he’s lost his career and reputation. But Mr. Conway said Lignelli was no dupe, but a white-collar crook who knew exactly what he was doing. In addition, he said Lignelli deserves no breaks because he was a trained, intelligent professional appraiser who deliberately inflated appraisals. In addition, he said, the relatively small group of appraisers in Pittsburgh need to realize that fraud will be punished by jail. More than 20 Arizona appraisers have filed complaints that accuse a San Diego company of failing to pay them in a timely fashion for finished work, public records show. The claims against AppraiserLoft, which shuttered without warning last fall, will be heard at 8 a.m. on May 17 by an administrative law judge in Phoenix. Before it wound down in October, the company helped lenders assign and manage appraisal orders in San Diego County and throughout the nation. Driving over the Coronado Bridge today on my way to do an appraisal (which happened to be rescheduled from 9am to a later time of 11am), traffic was nearly at a standstill. Rounding a car parked on the side I saw a lady swigging from a wine bottle while looking over the side. I was shocked nobody else was stopped. Well, I pulled in front of her car and started talking with her. After telling me her car broke down and that she was just waiting for a tow truck, I stayed within arm reach of her and tried to talk to her. After about 5 minutes of getting nowhere and no police yet she was getting irritated with me asking her questions and kept telling me to leave. FANNIE MAE tutorial on the Uniform Appraisal Dataset. On good authority FANNIE MAE is having a Q & A session on May 19, 2001 about the tutorial. It appears you must take the tutorial to be allowed to participate in the Q & A session. I am trying to win the Best Appraiser in San Diego position with our local newspaper. Three states: Illinois, Missouri and Nevada are considering legislation that would prohibit or restrict the use of “distressed sales,” such as foreclosures and short sales, as comparable sales as a part of a residential real estate appraisal. Homebuilders and real estate sales agents are concerned that the prevalence of distressed sales and their subsequent use as comparables, is resulting in the appraised value of residential properties not matching the contract sales price, or in the case of new construction, the cost to build. If you are selling your home with OR without a real estate agent you should get an appraisal before you decide on the selling price. An agent’s market analysis will get you in the ballpark, but do you really want to stumble around in the dark with your hard earned equity? I remember a retired couple that set their selling price based on the agent’s analysis. Their home sold in three days! When the appraisal came in it was $20,000 above the selling price. That was a terrible shame but it can be just as bad if you price it too high and it just sits on the market. An upfront appraisal will protect your equity and be well worth the cost. 2. Gather data of recent sales in the neighborhood. The appraiser needs to locate at least 3 similar-sized homes that have sold in the neighborhood with in the last six months. The homes also need to be within one mile of the subject property. These homes are called the “Comparable Properties” or “Comps” for short. 4. After the field inspection has been completed, the appraiser must determine which comparable properties most resemble the subject. Then he/she makes slight adjustments in value for any differences. After making the required adjustments, the appraiser must go through a reconciliation process with the three comparable properties to determine a final estimated value of the subject property. This method is called the “Direct Sales Comparison Approach to Value”, and it accounts for nearly all of the considerations in determining value of a single-family property. It is important to remember that the appraiser will be taking photos of the street scene and the front and back of the home. The street scene gives the lenders some kind of idea as to the type of neighborhood in which the home is located. The photo of the front of the home gives the lender an idea of its condition and its curb appeal. Lastly, the photo of the back of the home and part of the rear yard is another indicator to the lender of the home’s care and maintenance. In most cases, (over 90% of the time) what you see in the condition of an exterior home will be repeated almost exactly in the interior. So one of the most important things you can do to enhance the value or perceived value is to improve the curb appeal of your home, … and don’t forget to clean up the back yard. While your home is being inspected don’t follow the appraiser from room to room causing distraction. Instead, allow the inspection to go smoothly. In case the appraiser has any questions, be close by to answer them. The time to mention the things you think are important is either before or just after the inspection. Author: Connie Sanders has been in the real estate and mortgage industry for many years. Connie believes knowledge is power. She owns a Free For Sale By Owner web site, and an information site on Mortgage Underwriting Guidelines.